No need to descend a flight of stairs to access your home theater. Now, your living room can double as your very own screening room at the touch of a button. 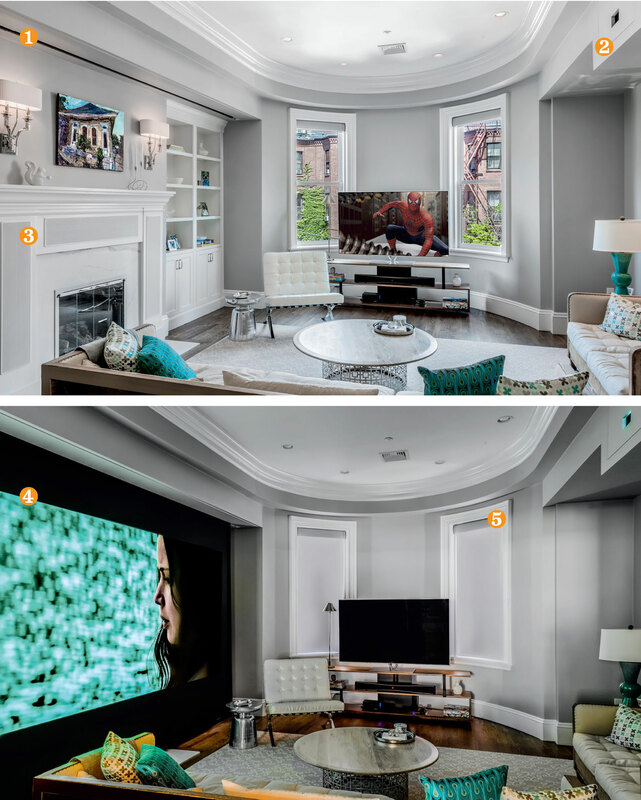 Evan Struhl, President and CEO of Cutting Edge Systems Corp., walks us through this living space’s A/V metamorphosis. A custom soffit was engineered around the room to house the equipment and mechanicals for the projector and the motorized screen. The incredibly lifelike 4K, full HDR image is produced by a concealed Barco Professional Laser Projector with certified, ISF calibration. A full 7.2.2 Dolby Atmos surround sound system is piped in through architectural speakers that are discreetly hidden in the walls, ceiling and the fireplace surround. Individual components manufactured by Leon Speakers. A 15-foot, silent, motorized, drop-down Stewart film screen descends from a slot in the soffit as the room darkens and the projector turns on. Automatic Lutron shades, with sophisticated hem bar alignment, were tailored for a precise fit on the arc of the bowfront windows.